Last Friday morning was very productive; baby and I managed to knock a few errands off the list by 10 am. We felt like we deserve a treat and stopped by Barnes&Nobel. If you are like us, when you are at B&N, books are only one part of the experience. The cafe is the other, and some may argue it is the better of the two. I must admit, I used to feel like a kid in the candy shop every time I found myself in front of their baked goods display. “What should I pick? Man, all of it looks irresistible. 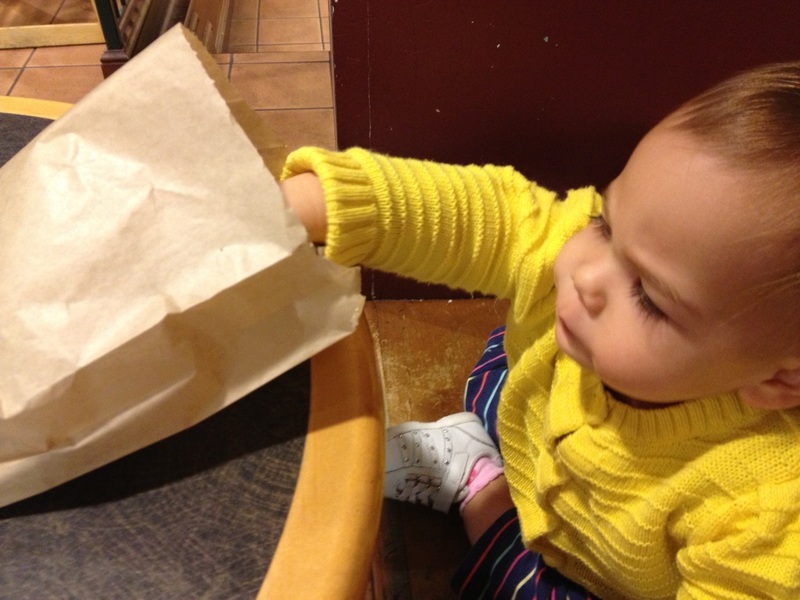 I deserve a treat!” My inner monologue moments before ordering some baked goodness. That was until a few weeks ago when I went to Starbucks website and started clicking on every bakery item to check calorie info. I was not glad I did that: I already knew that their drinks are higher in calories than my average dinner. Some of the bakery selection approaches my entire day’s calorie budget (just kidding…kind of). 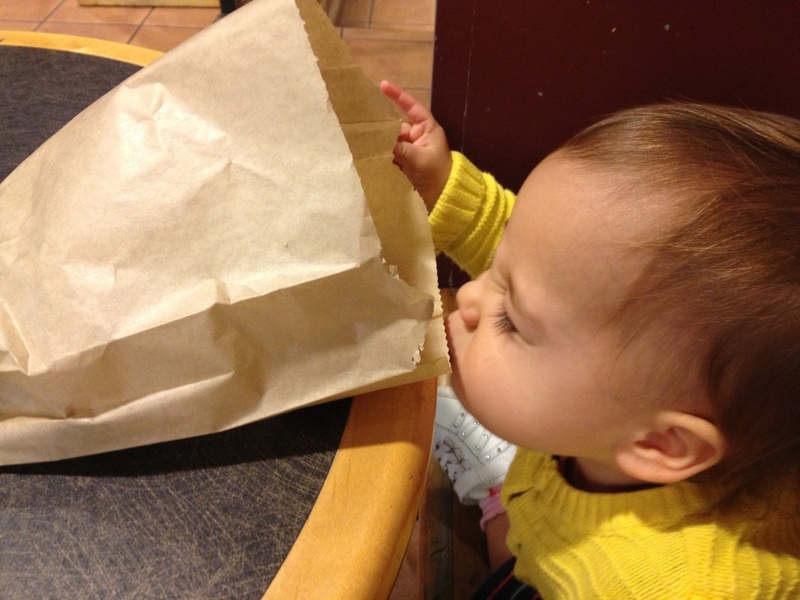 So, I let the baby poke at the blueberry muffin (which, by the way crumbled into a greasy, but yummy, mess– a sign of high fat content), while I had a cappuccino. The Starbucks muffins were a yummy treat, but great-tasting muffins don’t have to be so high in fat and calories. 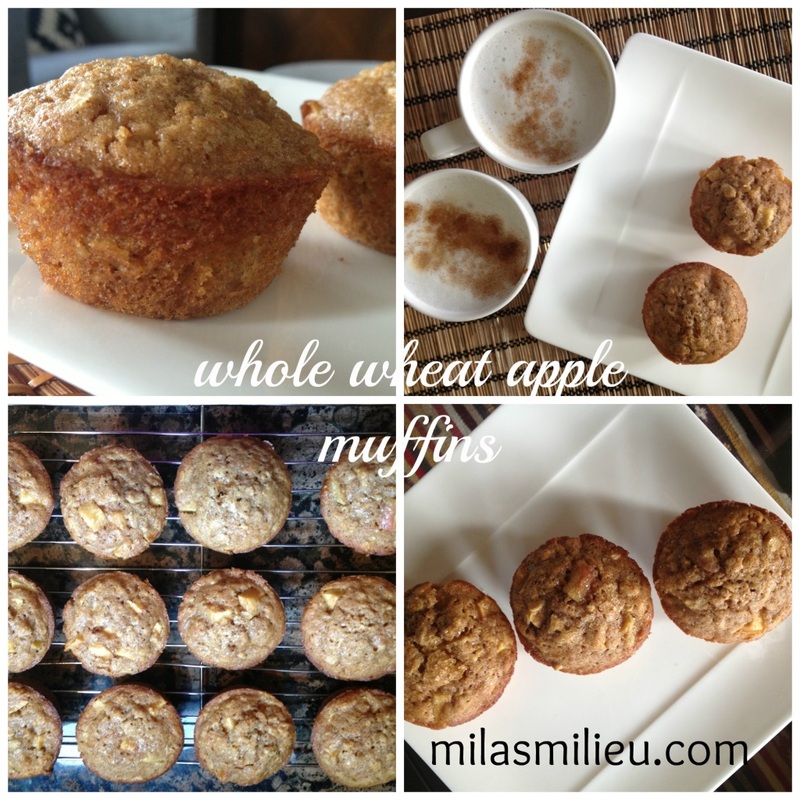 Today we baked our favorite whole-wheat apple muffin, thinking how unbelievably easy it is to have a treat that is healthy and so tasty it is addictive. The key to a moist low-fat muffin is buttermilk. I always keep it in my fridge for baking: muffins, pancakes, waffles, scones, etc. It keeps in the fridge for several weeks. Growing up in Russia, buttermilk was a staple, in place of yogurt. A cup of buttermilk with a slice of pumpernickel or rye bread fresh from the bakery, was my idea of a perfect snack. 1. Preheat oven to 350 degrees F. Spray muffin tin form with cooking oil (or use muffin tin liners). 2. Mix dry and wet ingredients separately, then stir them together with a spoon. Make sure not to over mix. 3. Fill muffin tin almost all the way full– muffins don’t rise too much. 4. Bake for 18-20 minutes (start checking after 18 minutes– ovens vary!) They are done when a toothpick comes out almost dry (unless you poke into an apple chunk). Mine are ready after 18 minutes. Let the muffin tin form cool for a few minutes and remove the muffins. Cool completely on the cooling rack before transferring to an air-tight container. If you are into such things, here is a comparison: the above mentioned blueberry muffin from Starbucks has 380 calories and 19 grams of fat per serving. Our whole-wheat apple muffin has 209 calories and 10.5 grams of fat per serving (I used caloriecount calculator). The baby approved of the results of this recipe, and ate these muffins just as enthusiastically as the higher calorie ones from Starbucks. I hope you will try it. Let me know what you think!